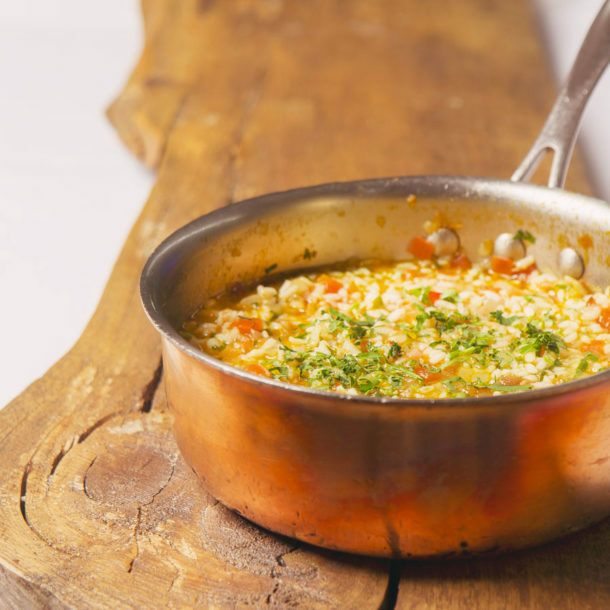 Learn how to make Carlos Ferreira’s famous fresh tomato rice when he has time to cook at home. A light, healthy and delicious side for every meal. Ideal with grilled meat or fish during barbecue season. 1. In a large saucepan, soften the onion in the olive oil. Add the white wine and the tomatoes. 2. Add the rice and stir well during the first two minutes. Over medium heat, add the chicken stock, approximately 250 ml (1 cup) at a time, stirring frequently. Wait until the liquid is fully absorbed before adding the next cup of stock. Add salt and pepper. Cook 30 to 40 minutes, or until the rice is al dente. Add chicken stock if needed. 3. Remove from the heat and add the fresh parsley. Stir and adjust seasoning if necessary.